The Women’s Archive of Wales exists to preserve and promote the history of women in Wales. Much work has been done to record the activities of the men who fought, and often died, during the Great War. Less attention has been paid to the women who were born in, or lived in, Wales during this period. This website sets out to record their names, the outlines of their lives and in many cases their deaths. Much of this material has been available on local websites and WWI message boards, but this is the first attempt to record it in one place, and to see the picture for the whole of Wales. We collect information about all women and girls in and from Wales. Some were already in professions such as nursing; some of these women joined QAIMNS early in the war. Others entered munitions factories, or from 1917, joined the WAAC, WRAF or WRNS. Many volunteered for Red Cross duties, either training as VADs or organising hospital supplies. Women from farming families continued to work on the land. Some of these joined the Women’s Land Army when it was established in 1917. Others took over ‘men’s jobs’, in factories, offices and in transport. Almost every woman and girl, however old or young, sewed or knitted ‘comforts’ for the troops. And most women at home worried about their fathers, husbands, sweethearts and sons, and struggled to manage with decreasing supplies of food. A few middle class women gave up this domestic struggle, and went to live in hotels. Many Welsh women lost their lives during the War. Stewardesses and nurses drowned when their ships were torpedoed or collided; munitions workers died in explosions or from chemical poisoning, and ‘Spanish flu’ claimed the lives of many nurses and others during 1918 and 1919. So far we have found almost 50 of these women recorded on war memorials throughout Wales. The War had a profound effect on the women of Wales. In the 1921 census, all Welsh counties except for industrial Glamorganshire and Monmouthshire, and to a lesser extent Brecknockshire, had an excess of women over men in the population, in the case of Caernarvonshire of nearly 11,000. Many women were destined never to marry, and with the withdrawal of jobs as the men returned to the workplace, had difficulty in supporting themselves. More positively, the Representation of the People Act, passed in 1918, granted the vote to women over thirty who met the property regulations. The vote was not extended to all women until 1928. 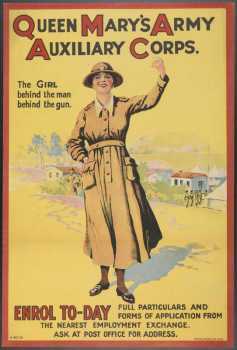 The Women’s Archive of Wales has been able to carry out this work thanks to a grant from the Heritage Lottery Fund’s First World War: then and now programme. This website will grow as we add to our collection and gather more information. We have also been assisted by many volunteers, to whom thanks. If you have any documentary material relating to any woman with Welsh connections, and are prepared to share it, please contact the site.